When it comes to being cool, no one had to teach Cool Ronny anything about ‘nuthin’! Sure, he never even finished the 8th grade, but who needs schoolin’ when you can just pick up stuff off the street the way Ronny can? For instance, ol’ Ron-Ron here’s the kind of guy who says “Hola, amigos” because he knows about culture. In fact, that translates into “hello friends” in Spanish! (or “es spanol", if you need get all book-smart about it). And when it’s time to tell you a story, he doesn’t just say, “Oh, let me tell you this story”…he uses sayings like, “I’m gonna rap ‘atcha for a minute” or “Dig this, maaaan.” Ain’t no teacher gonna teach you how to talk like that! And yeah, so he’s getting older and being a mechanical assistant at the bike shop is gettin' kind of old, but he'd rather be makin' dough than be a school nerd, right? Can't stack that green and save up for some sweet wheels when you're sitting in some boring classroom, filling your head up with useless stuff like facts, history, logic, and math! And when he gets that sweet motorin' machine - Cool Ronny's gonna be outta here! 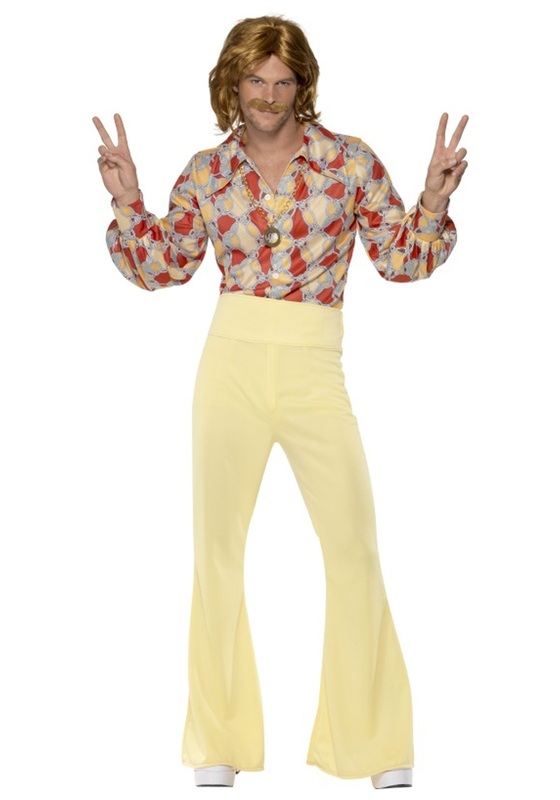 So if you're done with being a four-eyes square and you wanna be more like Cool Ronny, take a page out of his Hot Rod magazine by picking up some sweet, sweet threads like this Men's 1960s Groovy Guy Costume! 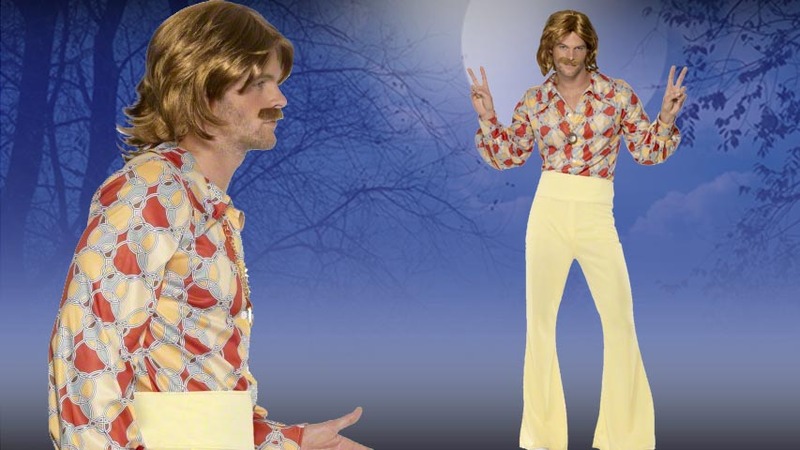 Hit the streets in these bell-bottom polyester pants and wide wing collar shirt, and you'll have all the Blue Jean Babies telling you you're numero uno (that's "number one" in Spanish!) in their book! That is, until a few years pass by and those honeys start to think that you probably should have at least finished the 8th grade...but until then, soak up the grooves, maaaan!